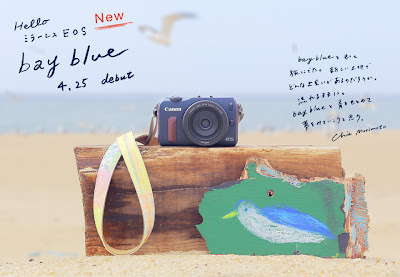 Canon announced a new color for the Canon EOS-M mirrorless camera. Starting April 25th the EOS-M will be available in the “Bay blue” color option. The launch comes with a special event, called the “EOS-M Photographic Journey”, replete with guest speakers and product showcases. Japanese art director Chie Morimoto was inspired by “Traveling” and created the new color scheme.